HTML and CSS are two of the most important technologies for building Website pages. HTML provides the structure of the page, CSS the (visual and aural) layout, for a variety of devices. Along with graphics and scripting, HTML and CSS are the basis of building Web pages and Web Applications. Restore online information via hypertext links, at the click of a button. Design forms for running transactions with remote services, for use in searching for information, making reservations, ordering products, etc. Include spread-sheets, video clips, sound clips, and other applications immediately and right away to their documents. Advantages of HTML and CSS. 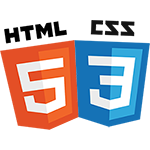 Using HTML5 and CSS3 contribute advantages to businesses that develop and deploy web content and web applications, to create refined and error-free web pages and web systems that function across devices, operating systems and web browsers. Write once, run anywhere. The plethora of devices, operating systems and screen sizes present numerous design, functional and layout considerations and problems if standards are not adhered to.